Lutify.me | How can I change the strength/opacity of the 3D LUTs in Adobe Photoshop? How can I change the strength/opacity of the 3D LUTs in Adobe Photoshop? 3D LUTs in Photoshop are applied in adjustment layers. Therefore, changing their properties is just like changing any layer’s properties. In order to reduce the strength of a 3D LUT, you should reduce the opacity of the Color Lookup adjustment layer. 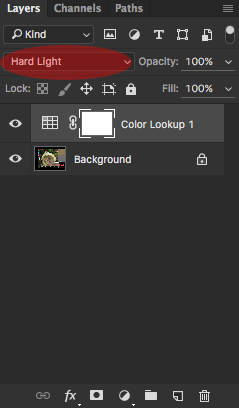 In the Layers panel, highlight the Color Lookup adjustment layer. Under Opacity, reduce the opacity of the Color Lookup adjustment layer until desired. 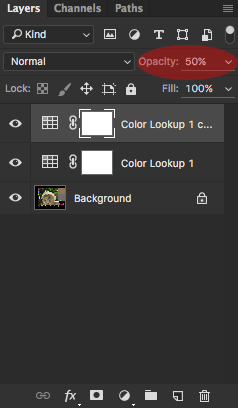 Select the Color Lookup adjustment layer and press Command + J (on Mac) or Control + J (on PC) to duplicate the layer. If you’d like to reduce the strength of the effect, reduce the opacity of the duplicated layer. Under Opacity, reduce the opacity of the Color Lookup adjustment layer until desired. Change the blending mode of the selected Color Lookup adjustment layer until you reach the desired effect. 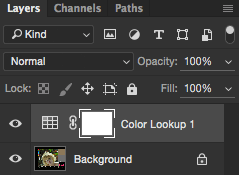 Please note that changing the blending mode will change other characteristics such as contrast, brightness, etc. Please refer to official Photoshop documentation for detailed explanation about different blending modes and their effects. If you’d like to reduce the strength of the effect caused by change of blending mode, reduce the opacity of the Color Lookup adjustment layer. Under Opacity, reduce the opacity of the Color Lookup adjustment layer until desired.